She swallowed a mouthful of gristle and placed one enormous paw on a shoulder socket, tearing up another strip of flesh. Blood coursed over her breasts, which were bare and beguiling where their soft whiteness met the tawny texture of her fur. 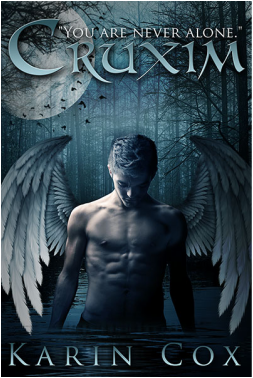 This entry was posted in Teaser Tuesday and tagged Cruxim, Fantasy, Karin Cox, Teaser Tuesday. Bookmark the permalink. Dude, children might be reading this LOL!!!!! Just kidding – I have this on my ereader, and it looks awesome. Should I be moving it higher up in my TBR list? I really enjoyed it. Has a different approach and the writing is great. Perfect to read while Mikey is grilling and you’re lazing about on my deck chair–off my chair! There is always a chair ready for you :). Ah, well that is mighty kind of you! Yikes! So who or what is she? I’ll reveal more in my review tomorrow! I really like that cover… very cool snippet too. I think you would like this one, Tania. Interesting book and an interesting passage, TBM! Looking forward to reading your review of it. Nice to know about Karin Cox. She seems to be a wonderful person. Karin really is. It has been a pleasure working with her on my novels. TBM I like this! As soon as I finish my morning comment routine I am going to join. Unless I lose forward momentum which happens frequently. But what a cool meme. It’s a lot of fun to see what everyone is reading and to get suggestions. Good teaser pick, leaves you wanting to know more. Intense and vivid teaser! Thanks for sharing. I think I saw this book a while ago. I think. Not sure. Kinda looks familiar. Thank you for sharing it! It’s a great book. I’m popping over to your blog now. thanks! grissle! yuck! abs though are yum! Very interesting! Definitely makes me curious. what a distinctive teaser! i wanna read that book soon! thanks for sharing! I really enjoyed the book. Today I’ll post my review. Thanks for stopping by! I love this concept… think I’ll have to start! That’s an attention grabbing teaser! It makes me want to know more about her. I really like this idea. Might have to give it a go! It’s a lot of fun! And I learn about so many different books.